Scania premiers its new Euro 6 Scania Interlink Medium Decker coach for liquefied gas (LNG) operations for a range of up to 1,000 kilometres, at IAA in Hannover, Germany, starting September 20. 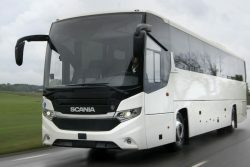 By doing so, Scania will extend the range of alternative fuel options to sustainable intercity coach journeys. The bus can be fitted with two tanks for a total volume of 912 litres, which is sufficient for a range of approximately 1,000 km (depending, of course, on route conditions). LNG operations have the potential to reduce CO2 emissions by 20 percent for natural gas and 90% from biomethane (renewable natural gas), at the same time substantially reducing nitrogen oxide and particulate matter emissions. Additionally, noise levels are significantly lower. 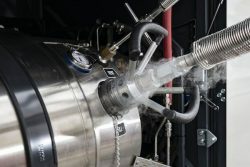 Some countries are also now starting to offer liquified biogas, cutting carbon emissions by 90 percent or more (depending on fuel source). Sustainability is Scania’s guiding theme at IAA. Visitors will have the opportunity to experience the bus first-hand on an internal route in the Deutsche Messe trade fair area.